3/4 Sleeve T-shirt - modifed shirt-tale hem. Available in brown, olive, red and black in Bamboo/C..
Cap Sleeve Tank great for under your best shirt for total comfort and coolness. ..
Cap Sleeve shirt perfect by day and comfortable by night. Pair with one of HotCool Wear's skirts ..
Short Sleeve T-shirt, slightly tapered with modified shirt-tail hem. Shown in Mello Mint. ..
Short Sleeve T-shirt in new Bamboo/Cotton fabrication. Pair it up with any bottoms, any of HCW fa..
Short Sleeve T-shirt, slightly fitted. 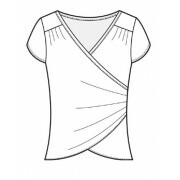 New Bamboo/Cotton/Spandex fabrication to help hold your sh.. It's A Wrap Sweater Jacket Wrap it, twist it, tie it or let it hang loose! So comfortable, s..
Just below the knees. Feminine and practical. Combines nicely with 'Night & Day' 3/4 Sleeve (.. 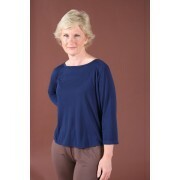 Perfect with the 'Tunic Top' or with any of HCW's tops or night shirts. .. 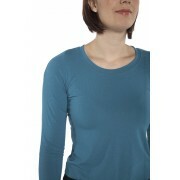 Perfect with the 'Cowl Neck' as shown or with any of HCW's tunic tops or night shirts. Navy leggi..
Long Sleeve shirt perfect by day and comfortable by night. Pair with one of HotCool Wear's skirts..
Mid-calf capri pant with flat-sewn hem. ..
New 'PJ Party' pant is a remake of our traditional PJ Party pant including side seams and we've d..
PJ Party pants. Elastic/Drawstring waist, long pant. Comfortable for sleeping or lounging. Limite..
Undershirt tank shirt to keep you cool all year round. ..